If you fancy a change from Barcelona for the day, why not head further north of Catalonia’s capital where you can unwind in the romantic ‘Ciudad de los Cuatro Ríos’ (City of the Four Rivers). 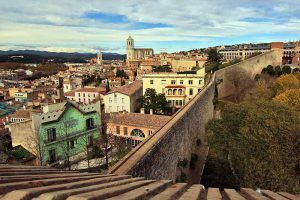 Located between the Pyrenean Mountains and the Costa Brava, Girona is a small city bursting with charm and plenty of sights to explore, making it the perfect day trip from the Catalan capital. Getting to Girona from Barcelona is straightforward and stress-free. We would recommend taking the high speed AVE train from Barcelona-Sants station with a journey time of around 40 minutes each way. There are quite a few trains that run each day. 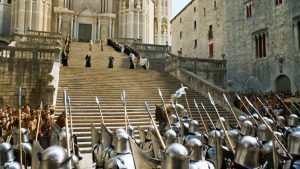 Many of you will already recognise some of Girona’s key locations from the leading television series Game of Thrones; however the Free City of Essos may sound more familiar to fans of the show. Locations where the show was filmed in Girona include the steps of Sant Marti, Els Banys Àrabs and La Catedral de Santa María. Visit these sights on foot or by hiring a segway around the city! 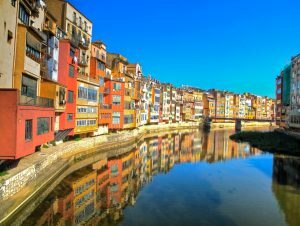 Girona’s Cases de l’Onyar is a stretch of beautifully coloured houses that are located along the river Onyar. From Casa Masò, located on the river, you can take in the postcard-perfect views of the houses that make up the most emblematic symbol of the city. This is a real ‘kodak moment’! 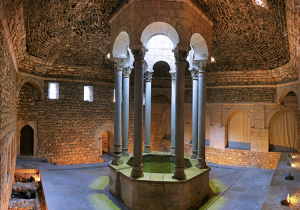 Els Banys Àrabs, or The Arab Baths in English, could definitely be described as one of Girona’s many hidden gems. One of your Game of Thrones sites, located at the foot of the Cathedral of Girona, this unique building dates back to 1194 and allows you to explore the several rooms in which the water temperatures fluctuate from cool to warm, creating a calming atmosphere where you can delve into the baths’ history and culture. This is definitely one for history fans! An extension made during the medieval ages of Girona’s Roman Walls today allows visitors to meander along its walkways, taking in the picturesque views of the city and its many gardens, courtyards and surrounding areas. A few lookout points make excellent photo opportunities so don’t forget your camera (and your stamina – these are the longest Carolingian walls in Europe)! We recommend walking the entire 3 kilometres before heading back to your apartment in Barcelona. Not a place for vegetarians, at L’Argadà you can find some of the best grilled meats in town. Swarming with locals and plenty of seating inside as well as out, this is a great choice if you’re feeling ravenous! Situated in a pretty little square, surrounded by quanit houses painted hues of yellow and orange, this little eatery offers plenty of traditional Catalan dishes. 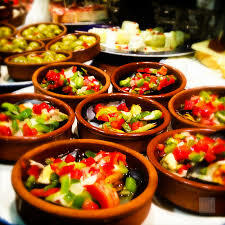 Enjoy tapas dishes such as croquetes or try a traditional plate of fideuà at very reasonable prices. More on the ‘fine-dining’ end of Catalan gastronomy, the pricier Divinum offers a white tablecloth eating experience where you can enjoy authentic dishes of Catalonia with a twist. If you don’t fancy the à la carte menu, there’s always the midday menú del mercat from Monday to Friday, featuring seasonal and local ingredients. Once you’ve ticked Girona off your list, why not check out some of our other day trip recommendations such as Lloret de Mar, or Sitges? Happy travelling!